You have a few main ways to find and watch videos on your iPad mini. You can fetch all sorts of fare from the iTunes Store, whose virtual doors you can open directly from the iPad mini. Or you can sync content that already resides on your Mac or PC. Movies, TV shows, and music videos from the iTunes Store: You can watch these by tapping the Videos icon on the Home screen. 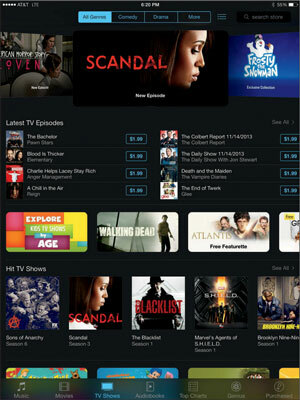 The iTunes Store features dedicated sections for purchasing or renting episodes of TV shows and for buying or renting movies. Pricing varies, but it’s not atypical as of this writing to fork over $1.99 to pick up an episode of a popular TV show in standard definition or $2.99 for high-def versions. And a few shows are free. You can also purchase a complete season of a favorite show. The final season of a classic show, such as Lost, for example, costs $24.99 in standard-def and $29.99 in high-def. A new release feature film typically costs $19.99 in high definition or $14.99 in standard def. But you can find HD movies for as little as $9.99 and sometimes even cheaper than that. You can also rent many movies, typically for $2.99, $3.99, or $4.99, though Apple usually serves up a juicy 99-cent rental as well. Not all movies can be rented, and we’re not wild about current rental restrictions — you have 30 days to begin watching a rented flick and a day to finish watching after you’ve started, though you can watch as often as you want during the 24-hour period. But that’s showbiz for you. Such films appear in their own Rented Movies section in the video list, which you get to by tapping Videos. The number of days before your rental expires displays. In some instances, World War Z being one example, purchasing a movie also affords you so-called iTunes Extras for your Mac or PC, featuring the kind of bonus content that is sometimes reserved for DVDs. Tap a movie listing in iTunes, and you can generally preview a trailer before buying (or renting) and check out additional tidbits: the plot summary, credits, reviews, and customer ratings, as well as other movies that appealed to other buyers of this one. And you can search films by genre or top charts (the ones other people are buying or renting), or rely on the Apple Genius feature for recommendations based on stuff you’ve already watched. (Genius works for movies and TV much the way it works for music.) 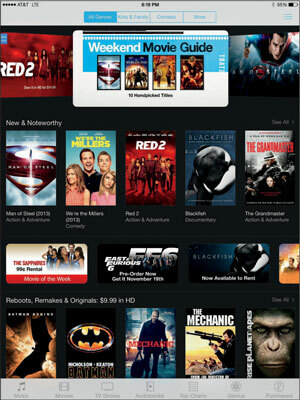 Apple also groups movies by various themes: Date Night Movies and Indie New Releases being two examples. The boatload of video podcasts and courseware, featured in the free Podcasts and iTunes U apps, both from Apple: Podcasts started out as another form of Internet radio, although instead of listening to live streams, you downloaded files onto your computer or iPod to take in at your leisure. Lots of audio podcasts are still available, but the focus here is on video. You can watch free episodes that cover Sesame Street videos, sports, investing, political shows, and much more. And you can take a seminar at Harvard, Stanford, and other prestigious institutions. 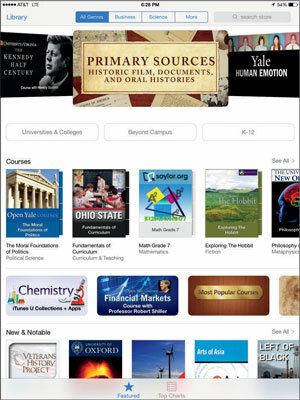 Indeed, iTunes U boasts more than 600,000 free lectures and other educational resources from around the world, many of them videos. Better still: no homework, no grades, and no tuition. Videos that play via entertainment apps: For example, Netflix offers an app that enables you to use your Netflix subscription, if you have one, to stream video on your iPad mini. Amazon’s appealing Amazon Instant Video streaming app, free for Amazon Prime subscribers, is also available. Various TV networks offer their own apps so that you can catch up on favorite shows on your iPad mini. The Hulu Plus subscription app also lets you tap into current and past shows. And if you’re an HBO subscriber, go for the HBO Go app. The movies you’ve created in iMovie software or other software on the Mac or, for that matter, other programs on the PC: Plus, you can view all the other videos you may have downloaded from the Internet, though sometimes you must convert these to a format the iPad mini recognizes. Videos you’ve given birth to using the rear- or front-facing camera: A version of iMovie is made for iPad minis (and iPhones) too. The optional app costs $4.99 but is free for anyone running a new iOS 7 device, and a free upgrade is available if you had an earlier version. You may have to prepare some videos so that they’ll play on your iPad mini. To do so, highlight the video in question after it resides in your iTunes Library. In iTunes, choose File–>Create New Version–>Create iPad or Apple TV Version. Alas, creating an iPad mini version of a video doesn’t work for all the video content you download off the Internet, including video files in the AVI, DivX, MKV, Flash, WMV, and Xvid formats. For a somewhat technical workaround without potential conversion hassles, try the $2.99 Air Video app from InMethod s.r.o. The utility app can deliver AVI, DivX, MKV, and other videos that wouldn’t ordinarily play on your iPad mini. You can also check out a limited free version. You have to download the free Air Video Server software to your Mac or PC to stream content to your iPad mini, even across the Internet. Or, for converting from a broader range of formats, try the excellent (and free) HandBrake application.